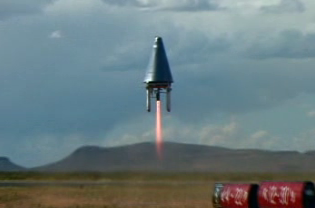 John Carmack (of Doom fame) has packed together his own team of top men in Texas – Armadillo Aerospace. They were the only qualifier for the Lunar Lander Challenge X Prize a few days ago. They didn’t succeed, but as a tribute to their gumption, Wohba brings you these videos of their past successes (and failures.) Just wait ’till next year. Here is the Space.com story on Yahoo. Feels like the future.